Multinational Cooperation for Development in West Africa discusses the obstacles and prospects of organizations that were formed to facilitate considerable cooperation in the developing countries of West Africa. 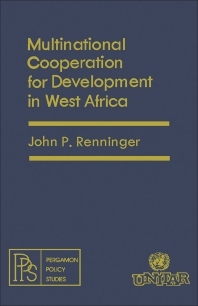 The book describes and analyzes the cooperation movement and the United Nations system and role in fostering the process of cooperation in West Africa. A brief overview of West African characteristics; trends and analysis of development; history of the cooperation movement; issues regarding cooperation in West Africa; potentialities of the Economic Community of West African States (ECOWAS); and the impact of the United Nations on the growth of cooperation in the subregion are elucidated in the text. Students of international studies, researchers, economists, sociologists, political leaders of the West African region, and the staff of United Nations agencies will find this book invaluable.